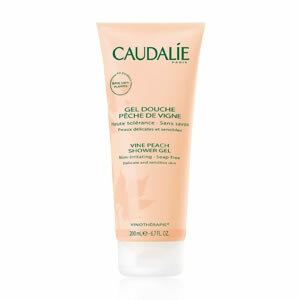 Caudalie Vine Peach Showergel transforms your shower into a moment of absolute relaxation with a nectar-like shower gel reminiscent of the vine peach. Caudalie Vine Peach Showergel is rich in aloe vera and is a soap-free shower gel formulated with a gentle, plant-derived cleansing base in order to maintain your skin's natural pH. Its intoxicating fragrance blends the sweetness of vine peach and almond milk with the invigorating freshness of mint leaves.